We prop up extraverts as shining examples of what to aspire to. We know more about celebrities’ than we do our own families. We let the TV vet the faces and voices we allow into our homes. When the medium is the message Tony Robbins and Mohandas Gandhi are on equal footing. We deify CEOs. We treat their biographies like sacred texts. We put them up on the same shelves as Sun Tzu’s The Art of War and Niccolo Machiavelli’s The Prince. We treat going out to drink as an accomplishment. We treat staying in to create works of art as a waste of time. Our HELP WANTED ads ask for goal oriented extroverts passionate about working in groups. We’re prompted to recognize our peers. Our passion for the job is mandated. Our enthusiasm is bottled up and labeled. We teach through an endless feedback loop of the Socratic Method. Questions answered with questions. We let the outspoken dominate our brain storming sessions. We presume confidence equals intelligence. We let public speakers control the marketplace of ideas. We hyper-schedule our every waking moment. We’re careful not to get sucked into the vortex of downtime. We have a field of screens to save us from a single moment of quiet contemplation. We demonize introverts. We’re quick to label the meek as creeps. When it comes to other people, we presume that what we see is what we get. Susan Cain argues the value of introverts. 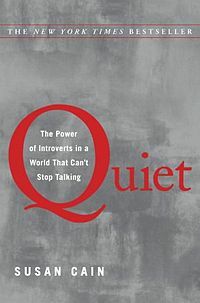 In her book Quiet: The Power of Introverts in a World That Can’t Stop Talking, we learn that Introversion has less to do with being shy and more to do with the amount of stimulation our brain’s require. Cain challenges the notion that extroversion is something that everyone can aspire to. She reasons that it’s a fixed personality type; part nurture and whole lot of nature. We learn that introversion is not a curse, that it comes with its own skill set. The introvert’s tool box contains: good listening skills, a heightened ability to empathize, cautious reasoning and an artistic temperament. She argues that many of the personality traits society perceives as negative are natural. She explains that the person who ducks out of the party early isn’t always having a bad time. She reasons that they’ve been adequately stimulated and need a moment to recharge. I usually roll my eyes when someones says a book changed their life. I don’t subscribe to the current wave of self-helplessness books. Nor do place much stock in the whole “7 Steps to Live Your Most Effective” whatever trend. This book changed my life. I’m not going to lie. I’ve been going through a bit of an identity crisis over the last year. I’ve been trying to force myself to be an extravert. I’ve tried to hammer a square peg through a round slot, to disastrous effect. Now I’m playing the hand I was dealt. This book reminded me of what, deep down, I already knew. Social encounters don’t have to leave me feeling like a Martian. I don’t have to feel like a fish out of water every time I stumble into a bar. Some people get more out of gatherings. Some people get more out of intimate conversations. Neither of these options are wrong. Society may place a higher value on extraversion. That’s okay. Introversion is a tough sell.